Just a few months ago, a helicopter ride tour of our beautiful Glens Falls region wouldn't have even been possible. 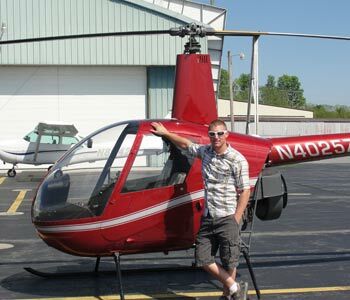 Luckily, a new business, North Country HeliFlite, has landed on the scene with a scenic helicopter ride service for the area, which I recently had the great fortune of experiencing first hand. Since I had never been in a helicopter before, I had absolutely no idea what to expect. The ride was unbelievably smooth, even for a 2-person helicopter zooming along at 90 mph! The helicopter allowed broad, panoramic views of the area you simply cannot get from an airplane. It was stunning. One thing that really stood out was how much greenery there is in Glens Falls / Lake George region. The views of the lush landscape were monumentally better from the sky versus what you can see on the ground. I had the pleasure of taking flight with pilot and flight instructor Zach Miller. Zach has been piloting aircraft since he was 16 and has since flown thousands of people. A Queensbury native, Miller lived in Utah for a few years where he continued to fly. Miller returned to his hometown in June 2009 and got together with Bruce Mowery, owner of North Country HeliFlite, to build out the company. They both noticed the lack of access to helicopter rides and instruction in the area and jumped at the chance to tap into the market. Based in the heart of the region at Floyd Bennett Memorial Airport in Queensbury, North Country HeliFlite offers scenic charter flights of the Lake George region as well as the Adirondack and Green Mountains. In addition, the helicopter company offers flight instruction schools and a vehicle for providing aerial photography and land surveying. Private charter flights are offered from 1/2 hour-2 hours at $500/hour. North Country HeliFlite has teamed up with area events including the Whitewater Derby in North Creek, where they offer 10 minute helicopter rides. They are also in talks with Six Flags Great Escape and Splashwater Kingdom to offer this same attraction at the theme park this summer. These 10 minute rides are priced affordably at $40 providing an inexpensive option for a larger demographic to enjoy a birds-eye view of our beautiful region via helicopter. Another unique offering North Country HeliFlite has under its wing is helicopter rides for special events. The flexibility and utility of the helicopter makes it possible to land at just about any event location and offer rides right there - perfect for birthdays, weddings, graduations, anniversaries and other special events. Interested in learning to fly a helicopter? You are in luck. North Country HeliFlite offers a flight instruction school for helicopter certification. To get a private pilot rating usually takes 2-8 months with about 2-3 hours per class. Flight instruction sessions are priced at $225/hour. Whether you have been on a helicopter before or looking to experience it for the first time, check out North Country HeliFlite and see the Glens Falls region from a different angle!